There are growing concerns about commercialization in national parks. Caribou startled by the click of camera and scent of a human. Parks Canada has opened the door to ski hill expansion at one of its Rocky Mountain national parks despite its own research suggesting that further development would threaten a nearby caribou herd. A report on the Marmot Basin ski area in Jasper National Park was completed more than a year ago, but was never made public. Lead author Fiona Schmiegelow decided this month she would release the report herself to anyone who asked. "I didn't want to say to people, 'No, I can't discuss this work,'" said Schmiegelow, a University of Alberta biologist. "I felt it was time for the work to be made public." 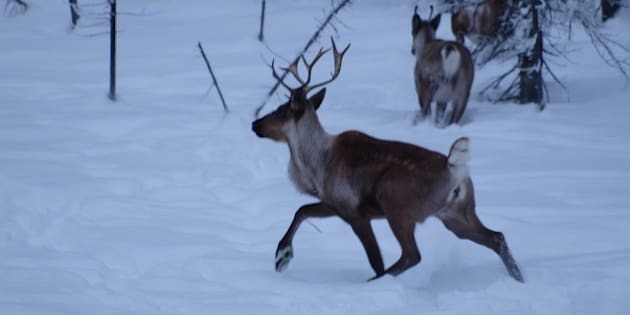 Schmiegelow was contracted by former Jasper conservation manager John Wilmshurst and the ski hill's operators to study possible effects of expansion on the Tonquin caribou. The herd, under federal protection as a threatened species, lives in the park next to the resort and has seen its numbers drop to fewer than 50 animals from 111 in 2006. Parks Canada is updating guidelines for ski hills in national parks. In an effort to cap commercial growth, resort operators have been asked to list projects they may at some point propose. Marmot Basin has suggested returning some land to the park, while increasing ski runs and trails on unused areas. Parks Canada agreed in June 2014 that the ideas would be considered. The ski hill has not yet tabled any formal proposal. Three months before the resort and the federal agency reached their agreement, Schmiegelow had concluded that not only would Marmot's plans damage important caribou calving habitat, some of Parks Canada's own planned trails and roads would be part of the problem. "These are additional pressures on a population that already seems to be struggling," Schmiegelow said. "If the primary mandate of the park is maintenance of ecological integrity, if conservation takes priority, we don't want to be doing anything that exacerbates the present condition." Schmiegelow said she was warned the release of her report could be delayed as Parks Canada developed a response. Six months turned to eight, then a year. Finally, when Wilmshurt was abruptly fired last June, Schmiegelow decided to act. "That was the catalyst. I felt (the firing) might precipitate requests for information about the work and I was not prepared to not release it any further." Jasper's acting conservation manager said the report is likely to be included in an overall package of information on plans for the area to be released this fall. Shawn Cardiff said the report contained "no surprises" for either Parks Canada or Marmot Basin. Cardiff said no decisions have been made. "That is the purpose of the report, to help us better understand what the potential implications are of some of the activities in the site guidelines. The ideas in the guidelines around lift development are subject to future decision-making." Any formal proposals from Marmot Basin would have to undergo an environmental assessment. There are growing concerns about commercialization in national parks. But Cardiff said guidelines agreed to by Parks Canada and the resort are simply possibilities. Stephen Woodley, a former Parks Canada chief scientist, said Schmiegelow's research should be guiding development considerations, not commercial interests. Woodley was also critical of a similar agreement between Parks Canada and the Lake Louise ski area in Banff National Park. "Caribou are in free fall throughout the mountain parks," he said. "We can't just keep chipping away. "You have to take a big picture and Fiona's study does that."